Mighty Crown is in high gear as they wrap up the U.S. leg of their 28-city ‘Driving Force Tour.’ And for fans in the U.K., this couldn’t happen fast enough! 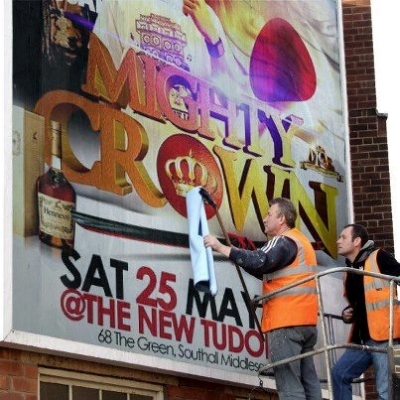 U.K. fans are anxiously awaiting the late May arrival of the ‘Far East Rulers,’ so much so that a massive billboard (not poster, but billboard) has been displayed in a popular location, boldly advertising the sound’s first U.K. appearance on the tour at London’s Tudor Rose on May 25, 2013…wow! Fresh off the heels of a month-long residency on BBC 1xtra’s popular dancehall radio show with Robbo Ranx, the Japanese sound warriors gave fans a dosage of what lies in store for their upcoming performances. Rocking hour long sets each Thursday during the month of March, Mighty Crown filled listeners ears with One Drop, Dancehall, Foundation and lots more. The segments, which were infused with one-of-a-kind Mighty Crown dub plates from top artists, big tunes, big vibes, big talk and history, certainly had audiences chatting! There has been quite an appreciation for Mighty Crown in England and Europe overall over the years. The sound’s overwhelming popularity among the country’s Dancehall supporters is a true testament of their extensive efforts and strong ties. Greatly contributing to Mighty Crown’s stronghold is their numerous World Clash victories, including those in coveted U.K. competitions attended by thousands. Heavily distributed DVDs of these legendary U.K. performances further solidified Crown’s position. In addition to thrilling U.K. audiences in the clash arena, Mighty Crown is no stranger to touring Europe. Heavy tours through out Europe attract legions of fans. This time around, ‘The Far East Rulers’ highly rated “Driving Force Tour” will have 5 dates in U.K. cities: London (2x), Nottingham, Manchester & Wolverhampton. The famed Japanese sound will even slide in stops in Biel, Switzerland and Berlin, Germany on this leg. Mighty Crown is just as excited as their many fans. The social media and the streets have been abuzz with ‘Far East Rulers’ Fever, circulating flyers and ‘save-the-dates’ several months in advance. 24-May Yaam Club BERLIN, Germany.